This is a celebration and tribute to the hit songs and enduring popularity of Bryan Adams. 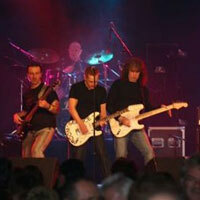 Formed in 1997, the 4 piece band replicate live performances that can only be surpassed by Bryan Adams himself. The part of Bryan Adams is played by Stuart whose resemblance not only in vocals but also appearance is so remarkable to the extent that to many watching, Stuart is Bryan Adams in all but name. Touring both internationally to crowds as large as 10,000 including major headlining gigs. They appeal to a broad range of people, and endeavour to involve them in the show throughout. An electric atmosphere is guaranteed, you will not be disappointed!